Why do we put tears in our soldiers' eyes? A close friend of three decades is a Brigadier and a true officer and a gentleman. He sent me a link of a write-up published in ‘THE CITIZEN IS YOU’ online daily, titled ‘A Requiem For the Martyrs’ by Lt. Gen. Syed Ata Hasnain, a much decorated retired officer who was known for his “Hearts is my weapon” campaign in J&K as a healing touch initiative for the troubled state. While the write-up made me think deeply, my own friend’s remark made me feel ashamed as a citizen of India. While forwarding the article, he asked, why are we (soldiers) pleading if it (recognition) is not there? What makes a fine officer of the Indian Army say that - or even think that? Someone who has been bestowed with one of the highest military honours for bravery in combat? That emotion could only come from receiving apathy, neglect and disconnect from us – the People of India. We, the People of India have failed him and ourselves - for India is defended by Indian soldiers and not soldiers from any other nation. They are us. Soldiers exist because a nation exists. Take away the idea of a nation and you take away the need for national defence and national armies and the need for men and women to lay down their lives to defend a nation. Therefore, shouldn't a nation feel some obligations towards its soldiers? Does my friend (or one of our countless other soldiers) deserves to feel like that? If any soldier feels neglected, unrecognised or forgotten, it is we, the People of India who must reflect on what has become of us. Indeed, the argument that soldiers are paid for their sacrifices is revolting. A doctor is generally considered next to God even though, in most cases, we pay through our noses to get treatment. Yet, a doctor is respected - we encourage our children to become doctors - precisely because there is a possibility of earning much more than an average soldier would earn (and no threat of death in action). A banker is also paid (and rather well) and retains a place in our modern pantheon of "achievers". A VP of a bank would be holding equivalent organisational stature and responsibilities as a CO in armed forces but as a society, the VP is more "valuable". We as a society even pay him several times more. Should this not be a matter of some concern? Are we, as a society becoming too commercialised? We have a tradition of “Gurur-Brahmaa Gurur-Vissnnur-Gururdevo Maheshvarah |Gurureva Param Brahma Tasmai Shrii-Gurave Namah ||” (The Guru is Brahma, the Guru is Vishnu, the Guru Deva is Maheshwara, The Guru is truly the Para-Bramha; Salutations to that Guru). But today, are we pushing our kids to become teachers? It just doesn't pay and hence it is no longer a "respected" or cared for profession. Is a soldier's profession another victim of our increasingly crassly commercial attitude? One of the attributes of a nation-state is sovereignty and its ability to defend its boundaries against external threats. Not every citizen is required to do so because a few choose to do that job. But their choice is not the same as the act of choosing any another profession like law, or films, or brokering or any other. By making that choice, it renders a soldier special for the nation because this choice enables others to be free to choose other jobs or professions. It's not that any profession is anything less, it's just that some professions deserve being treated as something more. No one in today’s world is born a doctor or lawyer or actor or soldier. Personal inclinations, capabilities, circumstances and opportunities place people in different professions. But the profession of a soldier requires him to kill or die for his nation – a requirement that doesn’t exist for any other profession barring the paramilitary/CPOs. Perhaps the only other even more difficult profession is espionage/intelligence. They are supposed to be soldiers but without a face – not even known or acknowledged. So why is it difficult for us to accept this difference and add respect and recognition over and above the "CTC" or monetary compensation we pay them as a society or a nation? What makes us “respect” and “recognise” someone who entertains us more than someone who is willing to kill for us – so that our own hands remain clean or die so that we may live in peace? Is it because in India we are blasé about people dying? It is interesting to read the National Crime Record Bureau Report (NCRB) 2012. Pg. 531 of the Report gives figures for 2012 alone as: 68676 recorded murders, death due to negligence 87334, 78 killed in police firing, 821 police personnel killed of which 83 by terrorists/militants and 61 by other criminals. At the same time, reports in public domain indicate 11 military casualties during 2011. So have we become benumbed? Because thousands are getting killed or are killing, where roads in the Red Corridor are strewn with corpses of policemen and civilians killed by Maoists each year, we have no value for the soldier who does so for a higher cause? Are we treating death in line of duty by a soldier in the same category as a murder? Are these commercial reasons and societal disdain the cause of massive shortage of officers in our armed forces? A shortage of 20-25% at officer level is a serious problem. Quite clearly, kids today are no longer interested in that career. Is it because they see the disdain in their parents' eyes? Is it because the lure of money has been perpetrated and encouraged? Is it because our society portrays our soldiers as bumbling fools who dash off to play war games and die whenever signalled while the rest of us "smarter lot" get on with improving our standard of living, acquiring wealth, giving foreign education to our children so that they can earn even better than us? Does that soldier not contribute to providing secure environment to enable our betterment? How much should that convert to in commercial terms? If the society doesn't want to pay that much, is it possible to compensate a bit by giving some respect, recognition and love? Those things don't cost. Or have we become a people who want to give nothing - even if it costs us nothing? Or do we begrudge them something? What? There's no point convincing ourselves that actually the soldier is given enough till the time the soldier looks downcast. 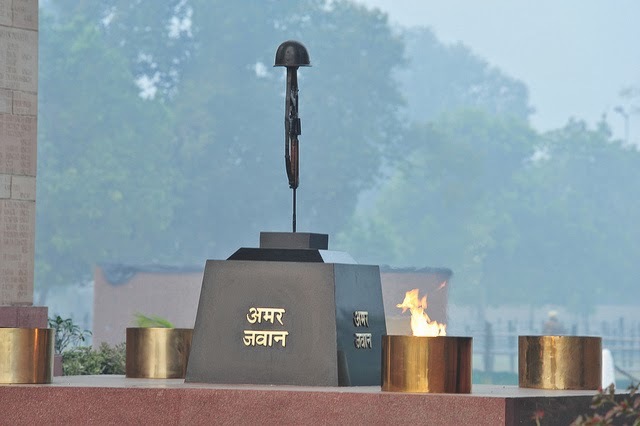 Do we think giving medals, uniform, his ration of few eggs and butter, the facilities of defence canteen, orderlies, dancing of film stars amongst jawans, sonorous debates on the TV when a soldier dies, giving a gun-salute and such other things enough "payment"? How many of us would trade all that with our lives when the occasion demands? If a soldier feels bad, feels unwanted, neglected - there's something wrong. I have interacted with many people in the armed forces but none who feels the nation is giving them their due. Can all of them be wrong? If so, they can only be extremely self-centred and greedy people for whom the phrase, 'Ye dil maangey more' means nothing more than a soft drink salesman's desire to earn more by way of bonus by selling more and perhaps also being given the 'Salesman of the Year Award'. Then our soldiers must all be Gordon Geckos for whom "greed is good". But why would such "greedy" souls lay down their lives for the nation? Or do we need to look into our own benumbed, commercial souls and answer the question, "Why do our soldiers feel unhappy and neglected?" I don't know how will our attitude change. I don't know how to bring that happy smile on my soldier's face. And that's a thorn in my side. Let me, in obeisance, bow my head!" ............................................................................................... Sorry - I simply couldn't resist.